SpaceUp Paris, the first space-related unconference in France, was held on Saturday 25 and Sunday 26 May 2013 at the European Space Agency headquarters in Paris. ESA opened to the participants the very room where the main decisions for the European space industry and science are taken. 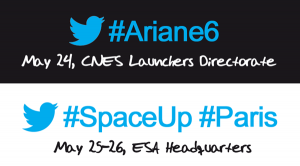 On the eve of the SpaceUp, the CNES also organised a kick-off event with a meeting between its engineers and the SpaceUp participants to discuss the future European launcher Ariane 6. A lucky few were event taken into the Salle du Futur, a concurrent design room where they were shown exciting pieces of technology, such as the planet projector! More than 125 people coming from 21 countries and 4 continents, all of them passionate about space, participated to this SpaceUp Paris. Among them, 50% were French and a third were women. As with other unconferences and barcamps, sessions were run freely by participants, with a huge variety of high quality topics, from orbital debris to space tourism and from orbital simulation software to planetary sciences. Among the participants were Marc Toussaint (ESA launchers expert) and many other professionals who spontaneously wished to share the passion they have for their jobs and present some of ESA’s amazing missions, such as the astronometry satellite GAIA, or Rosetta which will orbit a comet in 2014 and release its Philae lander to study the comet nucleus. Other experts from the industry and other organisations also presented their current work. Among those, NEOShield which is working on the best way to protect the Earth from a deadly asteroid collision. 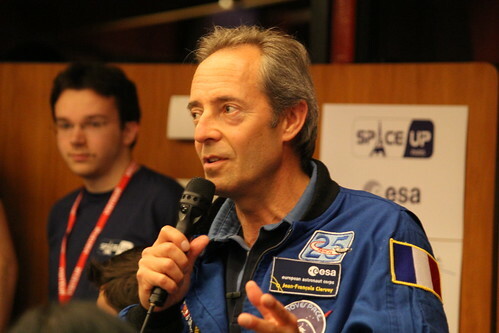 Throughout the weekend, four ESA astronauts (Jean-François Clervoy, Léopold Eyharts, Luca Parmitano and Thomas Pesquet) shared their space flights experience for the two former… and their training and future missions for the two latter. Several themes emerged from the SpaceUp, most notably a brainstorming on how to again arise the general public interest in space, via social networks or missions in which anyone could play a role, but also the emergence of an open source/open hardware space community. “The result of SpaceUp Paris is outstanding. To cooperate you must listen, be open to each other, learn to know each other. 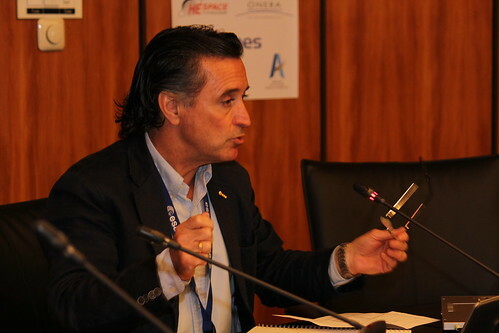 This is the spirit of the ESA, and this is also the spirit of SpaceUp.” says Fernando Doblas, head of the ESA Communication department. 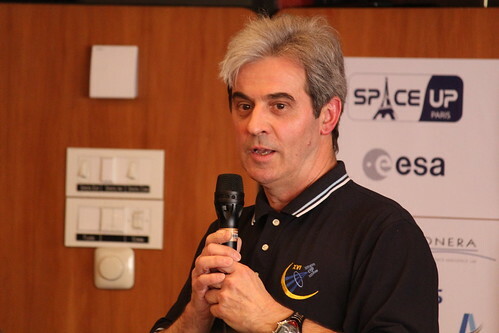 After taking part in many discussions during the weekend, Fernando Doblas concluded the SpaceUp by offering ESA’s support to any future SpaceUp unconference in Europe. 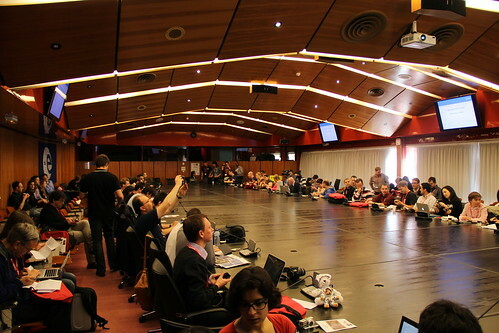 More than 1,500 people viewed the SpaceUp Paris livestream during the weekend. The livestream was available on the ESA web TV. The replay is here. Since the beginning of the project, SpaceUp Paris has been active on the major social networks: Facebook, Google+, and especially Twitter. During the weekend, more than 4,000 tweets were sent by more than 400 contributors. The reach (number of twitter accounts who received a tweet) was estimated at over 500,000 and the timeline delivery was over 6.5 millions. These figures only account for the twitter activity during the weekend, not the global impact of the event. This visibility makes SpaceUp Paris an outstanding success of which the team is proud of. Among the most notorious Twitter contributors were Jonathan Amos (BBC journalist), the Canadian Space Agency (CSA), the German Space Agency (DLR), the NASA astronaut Douglas Wheelock, the ESA astronaut Thomas Pesquet, the NEOShield team… and of course ESA and CNES. We want to take this opportunity to thank once more our sponsors, especially the European Space Agency (ESA) and the Centre National d’Études Spatiales (CNES), the french space agency. We also want to thank you for your continuous support, enthusiasm, outreach efforts… whether you attended in person, or followed along on the livestream or via Twitter. Let’s meet again soon!